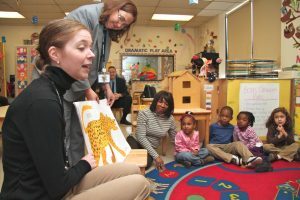 Leonard Lief Library's Coordinator of Access Services Adelaide Soto (foreground) and Substitute Education Librarian Alison Lehner-Quam read to three and four year-olds at the Lehman College Child Care Center. Children at the Lehman College Child Care Center were treated to a reading on November 11 by faculty from Lehman’s Leonard Lief Library—the first in a series of activities designed to introduce children to the Library’s holdings and help to cultivate a love for reading. “We wanted to highlight the great children’s collections that are part of the Library, and share these with students at the Child Care Center,” said Substitute Education Librarian Alison Lehner-Quam, who read Polar Bear, Polar Bear, What Do You Hear? by Bill Martin, Jr. and Eric Carle, as well as Violet’s Music by Angela Johnson and Laura Huliska-Beith, to the three and four year-olds. “Hopefully, they will get a sense that the Library is filled with wonderful materials and that they will be able to avail themselves of them for the rest of their lives.” For the December reading, the children will visit the Library for another reading. Coordinator of Access Services Adelaide Soto read Blueberries for Sal by Robert McCloskey to the children. The stories sought to highlight the five senses for the children, and encourage discussion about the narrative through reflective questions. The Library currently has an open stacks book collection of more than 600,000 volumes, 10,000 of which are children’s books that range from picture books to Young Adult literature. Holdings are supplemented by numerous electronic databases, state-of-the-art computer technologies, and growing media holdings. The Library is a designated Federal depository for government documents. The College recently broke ground on a $6.3 million Child Care Center that will double the capacity of its present center and serve 140 children for all-day and after-school programs. Because of its modular construction, the two-story center is expected to be ready for occupancy in Summer 2012. The Center will contain six classrooms and a multipurpose room that can function as a playroom, after-school space, or additional classroom. Outside, a natural playground will incorporate greenery, boulders, and garden space, along with traditional playground equipment.